You realised you just spent 3 hours reading your Facebook news feed while you really should’ve been writing that paper due tomorrow. To make it even worse, most of the status updates were completely uninteresting messages about FarmVille. Your mind is saying “DIE FACEBOOK DIE” but your heart is screaming for more. 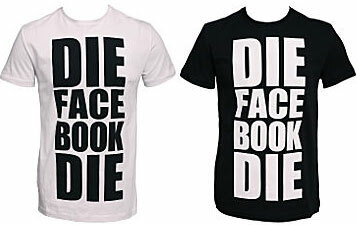 Rock Paper Scissors, designers of streetwear clothing, knows how you’re feeling and made these black-on-white and white-on-black “DIE FACEBOOK DIE” t-shirts. For haters. And part-time lovers. According to my own research, they’re currently only available in Europe via Zoovillage.com for €27 (about $39) each. By the way, remember the post we did on funny status updates you can wear? Well, the guys at Threadless are having a sale today: all t-shirts for $9 (guess why precisely that price!). Posted by Pieter on September 9, 2009 at 8:43 PM. Use this trackback if you're linking this story.